This episode parodies the American TV sit-com Alice which ran from 1976-1985 on CBS. The show is based on a movie called Alice Doesn't Live Here Anymore. The show is about the lives of several waitresses who work at a place called Mel's Diner on the outskirts of Phoneix, AZ. They wear pink uniforms and one waitress named "Flo," played by Polly Holliday, sports a beehive hairdoo. The cast of Alice. Flo is on the far left. Dr. Shoe wrote: This episode parodies the American TV sit-com Alice which ran from 1976-1985 on CBS. The show is based on a movie called Alice Doesn't Live Here Anymore. The show is about the lives of several waitresses who work at a place called Mel's Diner on the outskirts of Phoneix, AZ. 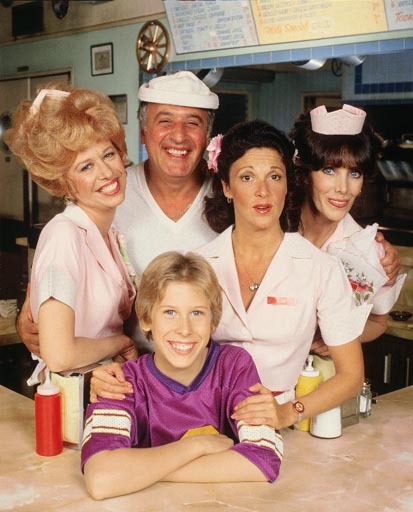 They wear pink uniforms and one waitress named "Flo," played by Polly Holliday, sports a beehive hairdoo. Where do you always get that information? Far from it. I just really love this show and I spend a lot of time thinking about it. You don't even want to know how my mind wound its way into figuring out the stuff I posted on this thread but I'll tell you it began when I started contemplating Kelly's Beehive hairdo. Thank God this forum gives me an outlet for my ridiculous hobby! Well, I for one am thankful for the interesting trivia bits you provide for us, Dr. Shoe! A lot of these things goes unnoticed for us outside the US. Anyway, I give this a 3.5. Fair episode, could have needed a little more of Al. Al: So, pumpkin, you always thought you were meant for something more, didn't you? You realize Kelly is her father's daughter and she's gonna gonna be stuck in the workaday slog along with him.